The Ring of Kerry is one of the most scenic drives I have ever done. It’s only 111 miles, but to do it justice, I recommend a few days to explore it. When we visited, we stayed for two days but didn’t have time to see everything we wanted. I hope to make it back to Kerry soon, it’s a beautiful part of Ireland with so much to offer. You won’t find many of the typical chain hotels in Kerry. That’s not a bad thing, but it makes it harder to choose accommodations. Together with my fellow travel bloggers, I have compiled a list of the best places to stay along the Ring of Kerry to help you plan your trip. Be sure to also check out my free travel planning checklist. Kerry is a county in southwest Ireland and it does have it’s own airport – Kerry (KIR) Airport. It is small but British Airways, Aer Lingus, and Ryanair all fly there. There is a bus that runs from Kerry Airport to Killarney for around €5 per person each way. Tickets can be purchased on the bus or online here. They also have rental car facilities. When we visited Kerry, we flew into Dublin and rented a car to do the three-hour drive to Killarney. Dublin has more flight options and plenty of attractions of its own (Book of Kells, Dublin Castle, etc). We would need the car for the Ring of Kerry. There is also the option to take a bus or train from Dublin for those that prefer not to drive. I think most people underestimate how much there is to do in County Kerry. There are many attractions and places to see along the Ring of Kerry, including Killarney National Park and the Gap of Dunloe. 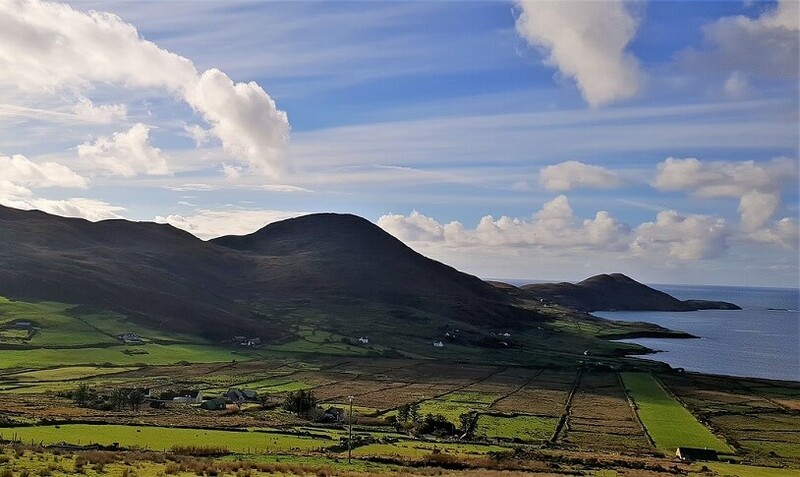 The Dingle Peninsula is another scenic drive that doesn’t get as much press as the Ring of Kerry but is supposed to be as impressive but less crowded. Additionally, you will want to allow time to explore the charming town of Killarney. While it is possible to drive the Ring of Kerry in a day that doesn’t do it justice! It’s easy to spend a full day visiting Killarney National Park. If you want to visit Skellig Michael that could take up a significant portion of another day. 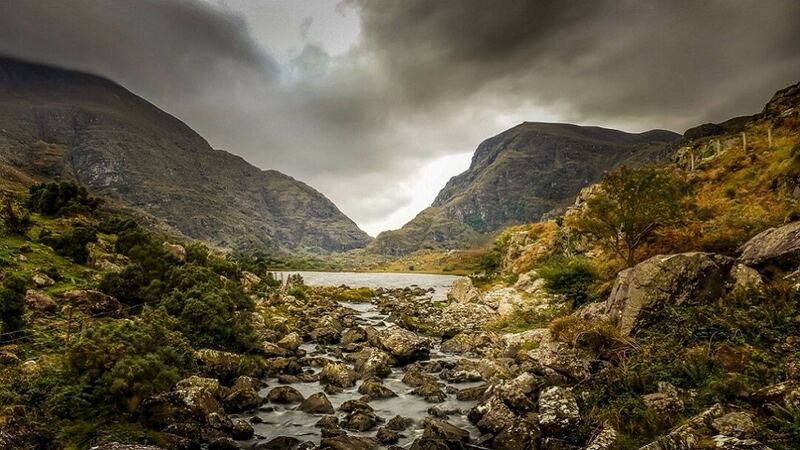 Also, don’t forget about gorgeous hiking in the Gap of Dunloe. I could go on and I haven’t even mentioned things to do on the Dingle Peninsula. If it were me, I would try to spend a week exploring Kerry. Don’t worry, you won’t get bored. More than likely, you won’t be ready to leave! Summer is the most popular time to visit Kerry Ireland. During the winter, some restaurants and other attractions may be closed. We went at the beginning of October. The weather was ideal, crowds were non-existent, but some places like the ice cream shop on Valencia Island were already closed for the season. The town of Killarney is a popular base to do the Ring of Kerry. Kerry is full of picturesque small towns and spectacular natural scenery. Most visitors choose to stay in Killarney. 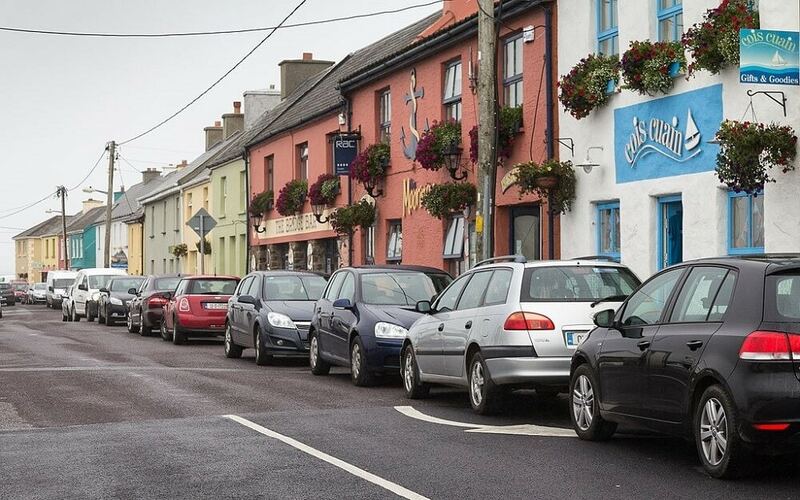 It’s the largest town in the area and the place most people start of the Ring of Kerry drive. There is a larger selection of restaurants and bars compared to other towns in the area. Not too far away, there is Killarney National Park. If you don’t have a car, Killarney is the best option because most tours will pick up there. From Killarney, it’s only an hour drive to the Dingle Peninsula. If time allows, head there while you are in the area. It is also feasible to stay in Dingle and visit the Ring of Kerry. There are several accommodation options just outside Killarney close to the National Park. For those that are looking for a more off-the-beaten-path place to stay consider smaller towns like Kenmare, Portmagee, or Tralee. The Ross Hotel is easily one of the best places to stay in Killarney for its comfort, stylish design, and location. This boutique hotel features 29 rooms that are modern and fun. Although small in stature, it boasts unique features that help it stand out as the best boutique hotel in the area. Upstairs you will find a cheerful terrace. In the basement, a hip restaurant and bar. The Ross Hotel is a 4-star boutique hotel in the heart of Killarney. 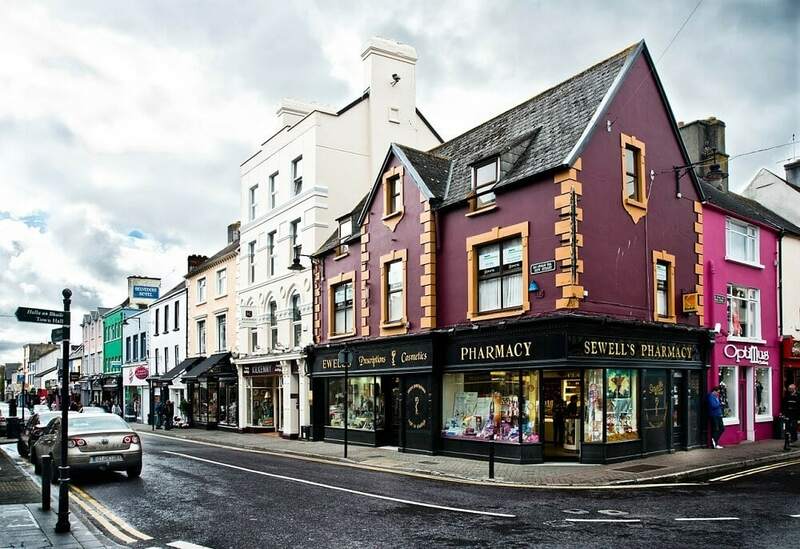 Situated steps from the Killarney’s shops and restaurants, the Ross Hotel is ideally located to explore the town or tour the Ring of Kerry. Lastly, although The Ross Hotel itself is not the oldest hotel in town, it is owned and operated by the same family that opened The Park Hotel. One of the most memorable places we stayed in Ireland was the Old Killarney Cottages. 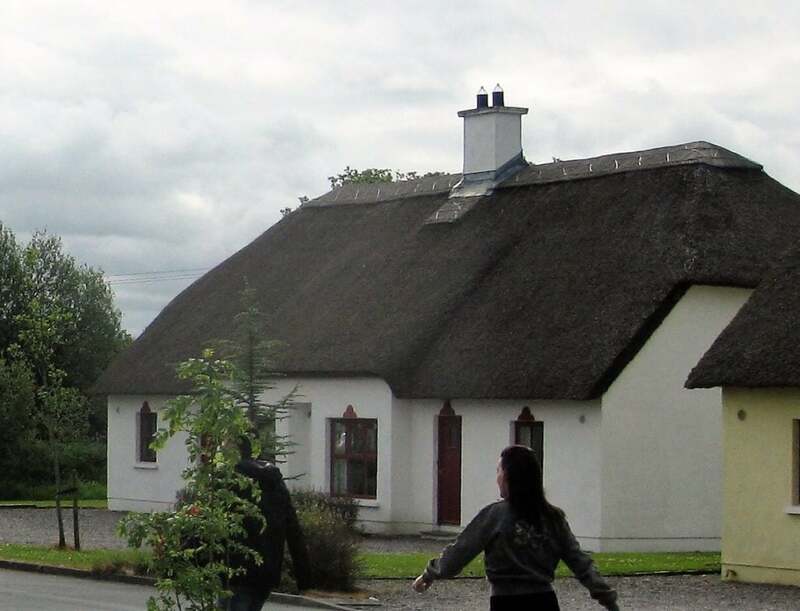 Located just a few minutes outside of Killarney town, these charming thatched-roof cottages are fully equipped homes with multiple bedrooms and amenities. We were on an Ireland road trip around the country and made a stop in Killarney to meet up with family. Staying with a small group is what made these cottages an even better choice. They are moderately priced, but with a few people, it made our stay quite affordable. Plus, having a fully equipped kitchen was nice so we could go grocery shopping (always a fun activity in another country) and cook for ourselves a bit – which saves some money and is enjoyable with a group of people. Old Killarney Cottages is a self-catering property, ideally located by the Ring of Kerry. 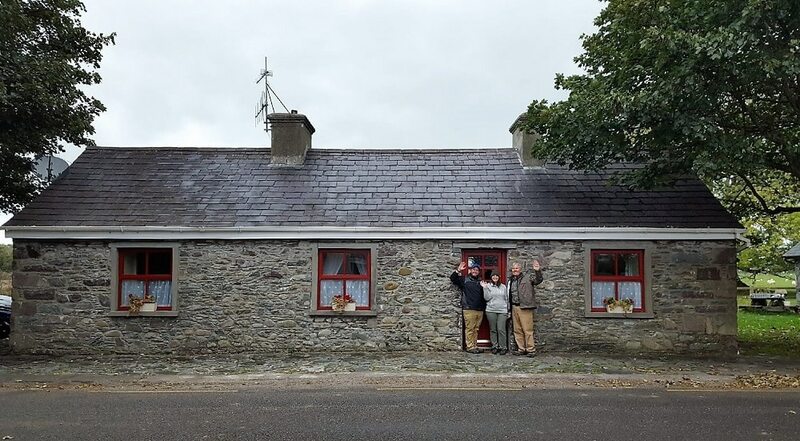 The Old Killarney Cottages were not only convenient for sightseeing in the area, but there was also a local pub within walking distance if we didn’t want to take the car into town. We thoroughly enjoyed our stay, with comfortable furnishings and a homey atmosphere. A perfect place to stay with a group of people for a wonderful holiday. Located in the small town of Beaufort just outside Killarney this cottage Airbnb is located on a working sheep farm. We saw countless sheep and a sheepdog during our two-night stay. There are two nice bedrooms and bathrooms which was perfect for two couples traveling together. There is also a small kitchen, washer, dryer, and living room with a fireplace and enough wood and turf for a fire. This charming Airbnb is located on a sheep farm! The location of this home is perfect. It is isolated along a tree-lined road but just minutes drive from Killarney town, the National Park, Kate Kearney’s Cottage restaurant, Ogham stones, and the Gap of Dunloe. If you are looking for a spot off the beaten path that is quiet, affordable, but still near all the best attractions this is it. The host was also very helpful with great recommendations of places to eat and things to do in the area. And if you’re there in the right season you will even get the chance to hold baby sheep! What more could you want?! Kenmare is the less crowded Killarney. 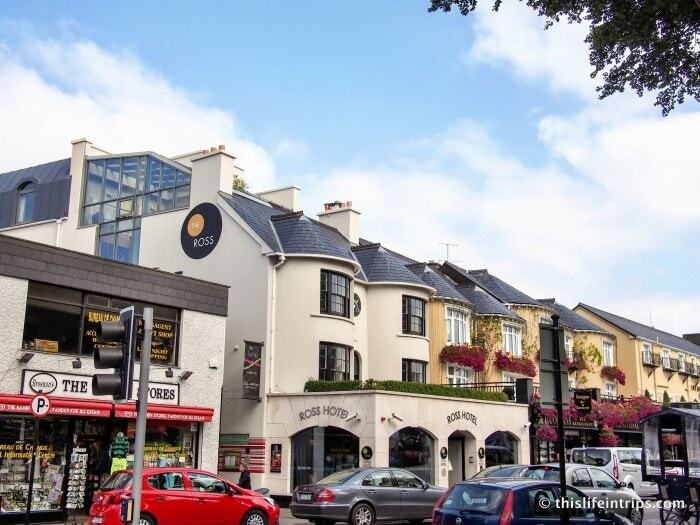 A scenic town on the Ring of Kerry, it has the added attraction of being home to the mysterious Kenmare Stone Circle and a renowned 5-star hotel that has been lauded by both Condé Nast and Travel & Leisure – the Park Hotel Kenmare. A Victorian landmark that dates back to 1897, the Park Hotel Kenmare excels in old-world service and charm. Think antiques – including a suit of armor in the hallway – manicured gardens and a fine-dining tasting menu that focuses on local cuisine. There is a cozy Irish bar and views of Kenmare Bay. 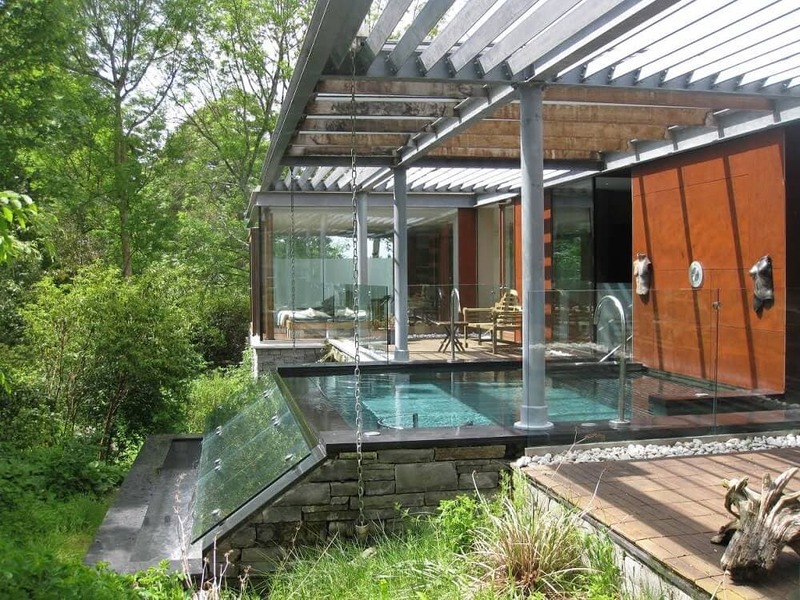 The infinity pool at the Park Hotel Kenmare looks dreamy! One of the property’s biggest draws is its award-winning spa, the Spa SÁMAS. A contemporary destination spa, it offers three-hour wellness journeys that include a visit to their thermal suite complete with sauna, steam, tropical shower and indoor pool. The highlight? The infinity-edge vitality pool sleekly tucked into a lush forest setting. The Mooring is a moderately-priced guesthouse in the village of Portmagee, Ireland. Portmagee is in the southwest of County Kerry, on a loop off of the Ring of Kerry, referred to as the Skellig Ring. While somewhat remote, it is the perfect location for those seeking to explore Valencia Island or visit Skellig Michael. In fact, the staff will help you arrange your trip to the world heritage site. The Moorings has 16 deluxe and sea view rooms. Deluxe rooms include 2 beds, telephones, wifi, satellite television, coffee makers, ironing boards, hair dryers, and complimentary toiletries, while sea view rooms feature a king size bed, a DVD player and jacuzzi bath. Rooms are spacious and bright, with contemporary furnishings, in ivory and deep red color. We were quite comfortable in our deluxe room. The Moorings is located on the main street in Portmagee. The Bridge Bar, the in-house pub, features traditional music and set dancing weekends, and on summer Tuesdays, an all things Irish night. The pub has friendly bartenders and draws a lively crowd most evenings. The Moorings Restaurant, serves locally sourced fare, including breakfasts for guests, and dinner which is open to the public. My birthday dinner at the Moorings was sumptuous. I recommend the seafood chowder! Ballyseede Castle, in Tralee, is truly one of the nicest and most luxurious places to stay in County. Kerry. I should know, I chose to get married here. Once you pass through the gates of Ballyseede castle you are entering into a magical world steeped in history and splendor. A long winding carriage drive, through ancient woodlands and manicured gardens, leads to an elegant castle that looks as if it were built to outlive the vices and follies of man through the ages. It has been fought over, lived in and loved, and carries forward its ancient grandeur to this day. 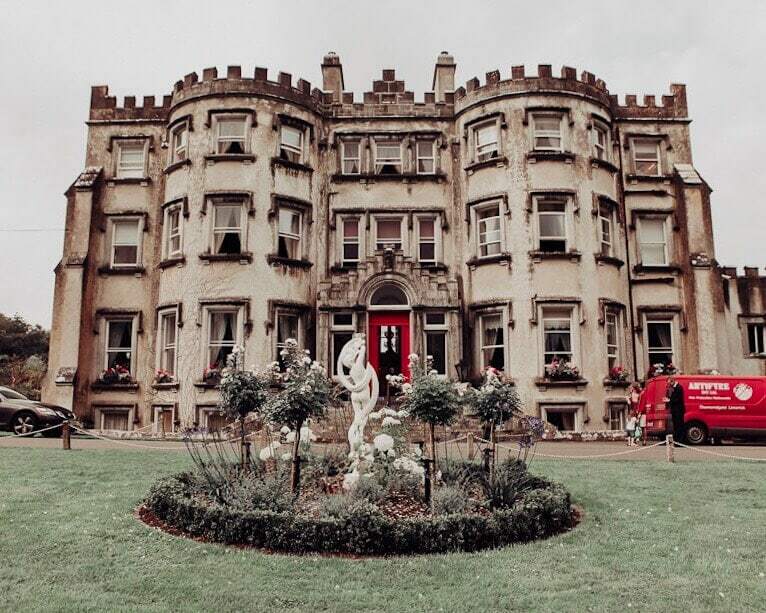 The character and charm of Ballyseede Castle makes for the perfect romantic getaway. Meander through elegant hallways and relax in beautifully furnished drawing rooms. Have the best pint of Guinness in Pappy’s Bar before exploring the woods of Ballyseedy. From the newly built Orangery, four-poster beds to the most delicious food you could ever imagine. You can see why Nicola chose to get married at Ballyseede Castle! I am in love with fairytale places and have stayed in my fair share of hotels in Ireland. Ballyseede Castle will have you falling in love with this part of Ireland. Did I mention that there is a resident Irish Wolfhound? If that doesn’t have you booking a night here I don’t know what will. When we drove the Ring of Kerry, we decided to stay at the Carriglea House. If you are wondering where to stay near Killarney National Park, this family-run B&B is about as close as you can get. It’s right across the street. We took advantage of the convenient location and went for early morning walks by the lake, then came back for the delicious two-course breakfast complete with white pudding. 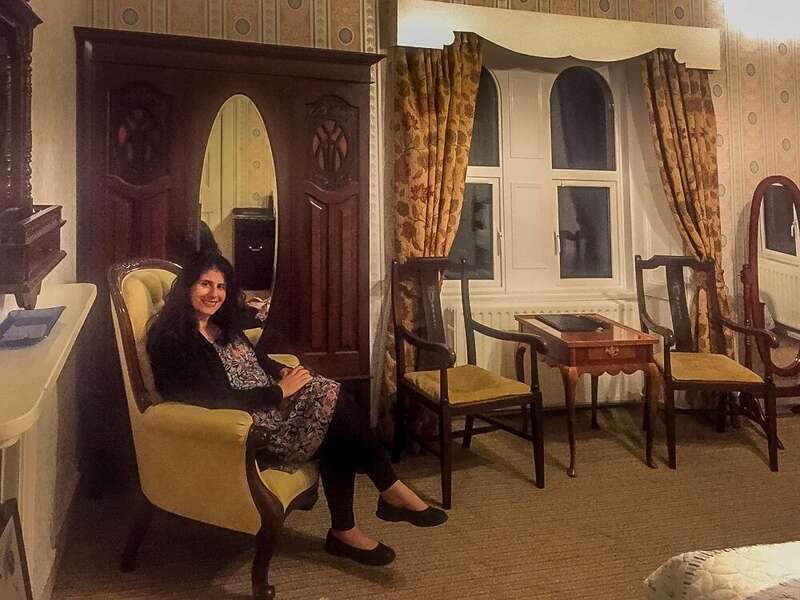 Anisa relaxing in her room at the Carriglea House by Killarney National Park. The house looks grand from the outside, and this continues indoors, with beautiful period furniture throughout that gives the B&B a very classy feel. The room we had was spacious and the bed was comfortable. The view of the National Park from our window was about as perfect as you could ask for. Drawing back the curtains in the morning and looking across the park with the hills in the background was a wonderful way to start a day. Keep in mind there are limited food options within walking distance, but that was fine for us since we had a car. It’s only a short drive to the Killarney town center. Book early, it’s a quaint place and tends to sell out especially during the peak months. Whether you are looking for budget or luxury, self-catering or B&B, in Killarney or a more rural area, there are many options along the Ring of Kerry. There may not be brand name hotels but rest assured the Irish hospitality is excellent. Have you visited Kerry, Ireland? Are there other hotels in Kerry that I should add to this list? Many of the options are small and will book up quickly. Book early especially for trips during the summer months. Without a car, it’s best to stay in the town of Killarney. If possible, try to spend a week in Kerry, there is so much to see! OMG, Ireland looks sooooo cute and I have never been yet there! I would love to stay in Katie Daly’s Farm Cottage, saving it for later! I hope you get the chance to go, it is a lovely country and the people are so friendly. This is making me want to get back to Ireland! Such a beautiful country with so much to explore! Katie – I agree. I would love to go back too.